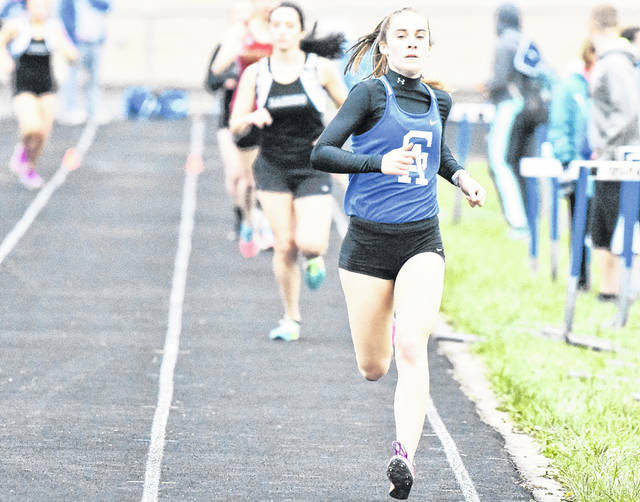 Gallia Academy freshman Sarah Watts strides toward the finish line during the 800m relay event at the 2018 Gallia County meet on April 10 at GAHS in Centenary, Ohio. NEW CONCORD, Ohio — Gallia Academy, Meigs and River Valley each had one athlete qualify for the state tournament on Saturday at the 2018 Division II Region 7 track and field championships held at Muskingum University. GAHS senior John Stout earned a spot in the 200m final after placing second at regionals with a time of 22.63 seconds. Stout also competed in the 100m dash event, but missed a state berth after placing fifth with a mark of 11.42 seconds. Gallia Academy sophomore Logan Blouir also competed on the second day of Division II competition, earning an 11th place finish in the high jump final with a mark of 5 feet, 10 inches. On the girls side for the Blue and White, freshman Sarah Watts competed in the 800m event and earned a sixth finish with a time of 2:23.33. Sophomore teammate Alex Barnes also provided a sixth place effort in the long jump final with a distance of 16 feet, 3 inches. The Gallia Academy girls team joined Buckeye Local, Philo, Union Local, Lisbon Beaver and Northwest in a tie for 27th place with six points. The GAHS boys squad tied Portsmouth and Miami Trace at 18th overall with 12 points. RVHS senior Nathaniel Abbott landed a state berth with a second place finish in the 800m final, posting a qualifying time of 1:57.15. The Lady Raiders had one participant in Day 2 of competition, as Elisabeth Moffett provided a 14th place effort of 93 feet, 5 inches in the girls discus final. The River Valley boys team finished 17th overall with a score of 13 points, while the Lady Raiders placed 35th with a score of four points in the girls standings. Kassidy Betzing was the lone state qualifier for Meigs, with a second place effort of 17 feet, 5¾ inches in the girls long jump event. Junior teammate Taylor Swartz also competed in the long jump event, posting a mark of 16 feet, 2½ inches while finishing in seventh place. On the boys side, the Marauders were represented in two events on Saturday as Bailey Caruthers posted a seventh place effort of six-foot even in the high jump. Senior Riley Ogdin earned a 15th place finish in the shot put with a heave of 42 feet, 11½ inches. The Lady Marauders finished tied with Logan Elm in 21st position in the girls standings with 10 points, while the MHS boys squad finished tied with Rock Hill, Jackson and Indian Creek in 37th place effort with two points apiece. Minerva won the D-2 Region 7 girls title with 52 points, with John Glenn (49) and Tuscarawas Valley (38) rounding out the top three spots. Sheridan captured the D-2 Region boys championship with 103 points, with Warren (49) and Steubenville (41) concluding the top three positions. The 2018 OHSAA track and field championships will be held Friday and Saturday at Jesse Owens Memorial Stadium, located on the campus of the Ohio State University. Visit baumspage.com for complete results of the 2018 Division II Region 7 meet held at Muskingum University.